Hezbollah is brazen, organized, and among us. They are sponsored directly by Shia fundamentalists in Iran. They exploit Western free markets to fund Iranian terrorism. NEW YORK: Two Beirut residents have been arrested on U.S. charges that they took part in an alleged scheme to help Hezbollah launder drug money, and to funnel thousands of weapons and military parts to criminal groups in Lebanon and Iran, prosecutors in Brooklyn, New York, said on Friday. Iman Kobeissi, 50, was arraigned in Brooklyn on Friday and held without bail, following her arrest a day earlier in Atlanta on charges of conspiring to commit money laundering and conspiring to deal in unlicensed firearms. While she ran the Points of Light Foundation, U.S. Senate candidate Michelle Nunn (D-Ga.), authorized MissionFish, a Points of Light donation processor, to pass contributions from eBay customers to charities of their choice, including Islamic Relief USA (IR-USA). The Nunn campaign refers to this authorization as “validation;” in other words, Points of Light had researched the charity and validated it for inclusion on MissionFish’s list of eligible charities. The Nunn campaign argues that $33,000 donated by eBay shoppers passed through Points of Light to IR-USA does not constitute a donation by Points of Light to IR-USA. That is disingenuous because what actually happened is that Points of Light received these ear-marked donations and then cut a check themselves to IR-USA. Points of Light benefits from the transaction because it increases the appearance of their overall charitable volume. The eBay customers would not have been able to donate funds to IR-USA while completing their purchases online if MissionFish had excluded the organization on their menu of options. IR-USA donates millions of dollars each year to Islamic Relief Worldwide, a UK-based organization that has been banned by Israel for aiding Hamas, and whose leadership is linked to the Muslim Brotherhood. A Department of Justice official has implicated IR-USA for being a conduit for the flow of money from America to terrorist groups abroad. Russian intelligence indicates that IR-USA funds militants in the North Caucasus—the region where the family of the Boston marathon bombers originate. Nunn and Points of Light could have discovered several of the red flags about IR-USA, many of which had already cropped up before validation occurred, by conducting due diligence research or even a basic Internet search. Unfortunately, Points of Light isn’t the first organization to legitimize IR-USA. IR-USA work has been acknowledged by Hillary Clinton’s State Department, the Obamas, the U.S. Department of Agriculture, and it maintains 501(c)(3) status with the IRS. These politicians and agencies have been willing to overlook questionable practices by IR-USA because of their eagerness to demonstrate cooperation with Muslim Americans and Islamic charitable sector. The embrace of IR-USA was exacerbated by IR-USA’s fraudulent representation of itself as a larger charity than it actually was by hyper-inflating the valuation of their deworming drug stockpiles. Although the value of deworming drugs may sound like a technical, minor point, it is not. IR-USA basically perpetrated a fraud for several years by overstating the value of the drugs which made up 75 percent of their assets. Bigger institutions like USDA and Points of Light are likelier to partner with bigger charities, which IR-USA seemed to be. If IR-USA had reported a truthful value of its donations and assets, it may not have been viewed as a big enough charity to attract institutional partners like these. A major charitable bundler like Points of Light had the resources to discover the disturbing truths about IR-USA’s connections to Hamas and its fraudulent financial statements prior to validation. It’s time that federal agencies and institutional donors started paying less attention to warm-and-fuzzy statements by politicians about what a great partner a certain charity is, and pay more attention to the results of basic due diligence research. Until then, and until there are changes at the highest levels of the IRS and the Department of Justice, and a willingness to confront IR-USA for its history of misrepresentations, we will probably see decisions like Nunn’s repeated again. This piece has also been published at Terror Finance Blog. Hacker Hamza Bendelladj’s malware infected personal computers in order to steal the financial credentials of unsuspecting users and sell the data to third parties. If one man with a computer and an Internet connection can operate a scheme like this, just think of what an enemy state actor could accomplish. ATLANTA—Hamza Bendelladj, an Algerian national also known as Bx1, will be arraigned on federal cyber crime charges for his role in developing, marketing, distributing, and operating the malicious computer virus SpyEye. The winning bidder? A recently incorporated company called “TruGlobe,” with three Turkish officers, who were somehow able to come up with over $3 million on the day of the foreclosure sale, at which cash or cashier’s checks are normally required as immediate payment. Both the Fulton Science Academy and TruGlobe have addresses in Alpharetta, Georgia. The similarities between the entities indicate probable collusion between the Gulen charter school and the winning bidder prior to the sale. It is worth noting that bid rigging at foreclosure auctions is a growth area for criminal activity. 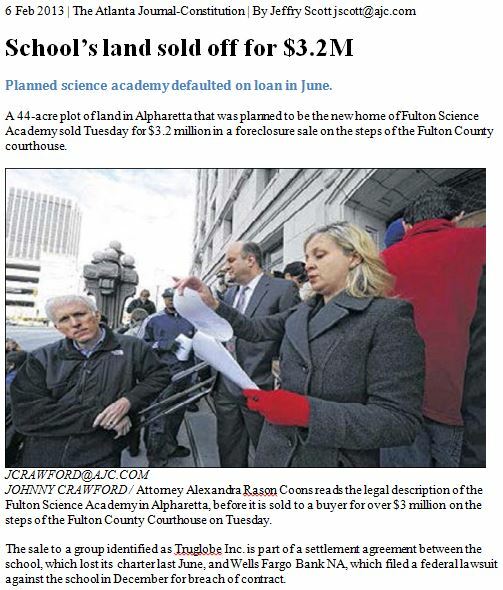 Did a Fulton Science Academy benefactor purchase their land? Has a Fulton Science Academy benefactor swooped in to save the embattled school’s construction project? Perhaps. FSA’s stalled construction project off Westside Parkway was sold in a foreclosure auction this past Tuesday. WSBtv reported this week via twitter that a firm by the name of TruGlobe Inc purchased the land on the courthouse steps for $3.2 million. TruGlobe is based here in Alpharetta, according to records at the Georgia Secretary of State’s office. Principals with the company appear to be of Turkish descent and have ties to the Turkish American Chamber of Commerce. Or it could all be an amazing coincidence. This blogger bets that the FSA will pursue a new state charter and attempt to revive their plans for new campus. Indeed, the registered agent and chief financial officer of TruGlobe is listed as Ahmed Vehbi Ugur, a young man who describes himself as a board member of the Turkish American Chamber of Commerce of the Southeast. Ugur is also registered as the CEO of the Maress Corporation, a Turkish kitchen appliance business with an Atlanta office. The Fulton Science Academy belongs to a network of troublesome charter schools under the direction of Fethullah Gulen, an activist who seeks to replace the formally secular government in Turkey with a sharia-dominated Islamic caliphate. Gulen schools have undertaken an influence peddling and crony contract scheme in Texas, improper financial activities in Georgia, were denied a charter in Virginia, and are currently under an FBI investigation for kickbacks. Fulton County itself has recommended early revocation of FSA’s charter due to educational and financial shortcomings. The State Board of Education of Georgia may consider such a suspension when it meets this month. UPDATE—April 8, 2013: A colleague has noted that the Turkish parties in this case appear to have acquired a $19 million property for a fire sale price of $3 million, short-changing Wells Fargo and the Development Authority of Alpharetta by $16 million in the process. Technically, the full $19 million debt owed by Fulton Science Academy has not been extinguished by the foreclosure sale to TruGlobe. Wells Fargo could have pursued a confirmation of deficiency proceeding against FSA for the $16 million still owed. However, Read the rest of this entry ? Like many prominent Saudis, Pharoan peddled influence in the U.S. prior to his indictment without regard to political party, allegedly forming relationships with Henry Kissinger, members of the Carter administration including Bert Lance, and George W. Bush before he became involved in politics—a sign of the great lengths to which the Saudis have gone to curry favor with American officials. The Guardian examined the French report (h/t History Commons) in this difficult-to-Google article below. Thanks to Rushette for suggesting more coverage related to this subject. Osama bin Laden’s extensive financial interests in Britain are outlined today in a French parliamentary report that says the City is a money laundering haven for billions of pounds of tainted and terrorist money. Up to 40 companies, banks and individuals based in Britain can legitimately be suspected of maintaining direct or indirect relations with the terrorist, according to a 70-page annexe, The Economic Environment of Osama bin Laden, attached to the French report. Compiled by an independent team of financial experts whose identity the French parliamentarians have undertaken not to reveal, the annexe reveals that the structure of Bin Laden’s financial network bears a striking similarity to that used by the collapsed BCCI bank for its fraudulent operations in the 1980s. “This document clearly shows the great permeability of the British banking and financial system and the fragility of the controls operated at its points of entry,” write the authors of the French report, a copy of which has been obtained by the Guardian. The annexe establishes numerous links between Bin Laden with international arms and oil dealers and even members of the Saudi elite. It also pinpoints the relationship and its subsquent breakdown between Osama bin Laden and his family’s holding company, Saudi BinLadin Group, and its multiple subsidiaries, investments and offshoots in Europe. Many of the individuals concerned, several with British connections, were also involved in various senior roles with BCCI, the report says. Hundreds of banks and companies are mentioned, from Sudan, Geneva and London to Oxford, the Bahamas and Riyadh. The names of half a dozen former BCCI clients and officials, including Ghaith Pharaon, wanted by the US authorities for fraud, and Khalid bin Mahfouz, a Saudi banker who was closely involved with the bank before it was closed down by the Bank of England in 1991, recur throughout the annexe and are directly linked to Bin Laden through banks, holding companies, foundations and charities, at least one of which, the International Development Foundation, has its headquarters in London. Now, that it’s the holiday season and a time of buying and giving Christmas and Chanukah gifts, a lot of people make the convenient choice of sending fruit baskets to their friends and professional associates. But if you take this route, DON’T send a basket from Edible Arrangements. If you do, you are funding HAMAS abroad and Muslim community organizing, such as the group IMAN, the Inner City Muslim Action Network, in the U.S.
Tariq Farid is the CEO of Edible Arrangements, which he started with his brother, Kamran Farid. Not only are they devout Pakistani Muslims, but they are major donors and fundraisers for American mosques, Islamic schools, and similar enterprises in Pakistan. Recent tax returns of their Farid Foundation, to which they and Edible Arrangements are major contributors, show that their foundation gives tens of thousands of dollars to extremist Islamic schools and mosques in America and to Islamic Relief, the HAMAS/Al-Qaeda/Muslim Brotherhood “charity” which sends tens of millions of dollars to finance jihad around the world. An Islamic Relief fundraiser I attended undercover featured young Muslim Arab kids simulating beheadings of Americans, Brits, and Israelis as the evening’s “entertainment.” And as I told you, Islamic Relief’s chief official in Gaza was a HAMAS official with Bin Laden’s photo, swastikas, and a “G-d Bless Hitler” banner as his screensavers. Sigh. How can we ever hope to eliminate terrorist financing overseas if we can’t even stop it at home? Edible Arrangements has over a thousand stores, including locations in Saudi Arabia, Jordan, Qatar, Turkey, Kuwait, Bahrain, Oman, the U.A.E., and oh, let’s see, 107 stores in California. Our Georgia readers may be interested to know that there are 29 of these stores in the Peach State, including one at Hartsfield-Jackson International Airport.